Aramark, the largest U.S. based food service company, who serves two billion meals each year, and the American Heart Association (AHA), the leading voluntary health organization devoted to a world of longer, healthier lives, today reported results from the third year of their Healthy for Life® 20 By 20 collaboration, which aims to improve the health of all Americans 20 percent by 2020. Launched in support of the Healthy for Life® 20 By 20 initiative, Aramark’s Feed Your Potential consumer engagement campaign utilizes an ever-growing health promotion toolkit to encourage consumers to try healthy foods. Worked with 300 local community centers and organizations in 50 cities to help families in underserved communities learn how to discover, choose and prepare healthy food, through hands-on educational experiences. A majority (60 percent) of participants increased the amount of fruit, vegetable and whole grains they eat each day, after participating in the program. Developed an online tool containing science-based educational experiences, orientation materials, recipes and support resources, all free to download, for program leaders around the country. 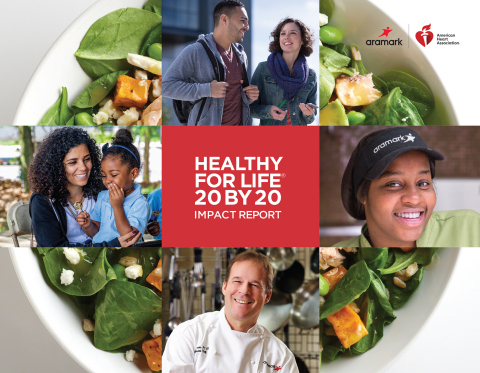 In 2015, the American Heart Association and Aramark introduced an innovative new health impact model. The initiative established a multi-year collaboration between a preeminent health organization and a leading food company, who committed to working closely together to leverage combined reach and resources, as part of a nationwide initiative designed to help millions lead healthier lives. For more information on Healthy for Life® 20 By 20, visit: http://www.aramark.com/healthyforlife. Sign up to receive healthy tips and recipes on www.fyp365.com or follow @Aramark on Instagram.